The salvage stations in Camelle are a sign of the growth in importance Camelle underwent in the twenties of the last century, now disappeared, like the shipwreck of the sloop San Fernando in the waters of Trece. 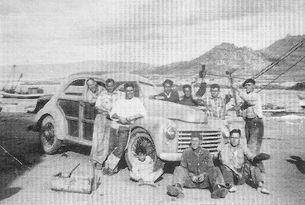 In the year 1898, the Barbeito Rodríguez and Company Salvage Station was established in Camelle. It was devoted to coming to the aid of ships in need, salvaging their cargos and dismantling and making use of their plunder. 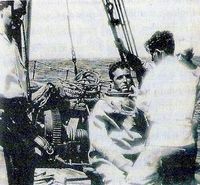 It was equipped with several boats like the “Camelle”, “Pepe”, “P.F.”, a workshop boat called “Finisterre”, a store (in the current Casa del Alemán) and several divers available to it. 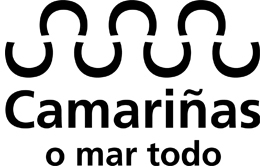 In the year 1904 it changed its name to Compañía de Salvamentos Marítimos (Maritime Salvage Company) and widened its activities to the area between A Coruña and Ferrol. Apart from the founding partners, Juan Barbeito and Federico Rodríguez, the nephews of José Pastor and children of Marchesi Dalmau were also on the board of directors. In addition to hiring the crew for its boats, it served as a school to train the best divers and professionals in these tasks. Also, Camelle was the reception centre of all the shipwrecks, representatives of insurance companies, customs staff, and consuls from different countries, because in the offices of the company the opening enquiries were carried out, and accommodation was found for shipwreck victims, as well as transport when they had to be moved. Other companies came to take their place in the procurement of the best divers and professionals on the Costa da Morte, such as: Pastor Company, Viuda de Márquez Company, José Vázquez Company, Pérez Leis Company, etc.